The act of proclaiming or the condition of being proclaimed. Something proclaimed, especially an official public announcement. The great thing about proclamations is that they can inspire you to follow through on what you proclaim by holding your feet to the fire. That is if you have made a public proclamation. What are you courageous enough to declare over your life in 2019? Is there something that you have been talking about doing for a long time that you are ready to proclaim? Maybe you want to lose ten pounds or start that exercise regimen? Perhaps you need to give yourself a "me" day once a month where you do something strictly for yourself? Can you think of something that you can proclaim over your life? Let's take the kid gloves off here. Maybe you'd like to make a difference in this world? That's my plan. I'm boldly proclaiming that in 2019 I will help over-achieving, perfectionist, enabling, and people pleasing women, find balance in their lives so that they can experience the peace that surpasses understanding and unspeakable joy. I will inspire them through my coaching, writing, blogging, Facebook Lives, Youtube, Linkedin and any social media outlet that helps me to reaching the ladies that need my support. I will use all of the wisdom and knowledge that God has blessed mewithto empower women to be all that they can be and have all that they should have. Man, it feels so good to put it on paper and say it out loud. It's so empowering! Now you try it. Seriously, stop reading right now and grab a piece of paper and a pen and write down what you are proclaiming for 2019. How did that feel? Are you ready to make 2019 the best year ever? I'm praying that you will make your own proclamation today. It can be as simple as eating dessert only once a week or as big as losing 40 pounds. You could commit to dusting your house once a week or doing Spring cleaning twice a year. Here's one that I need to follow through on. How about cleaning out your closets and giving all of that stuff you no longer wear or use to a charitable organization to help someone else? 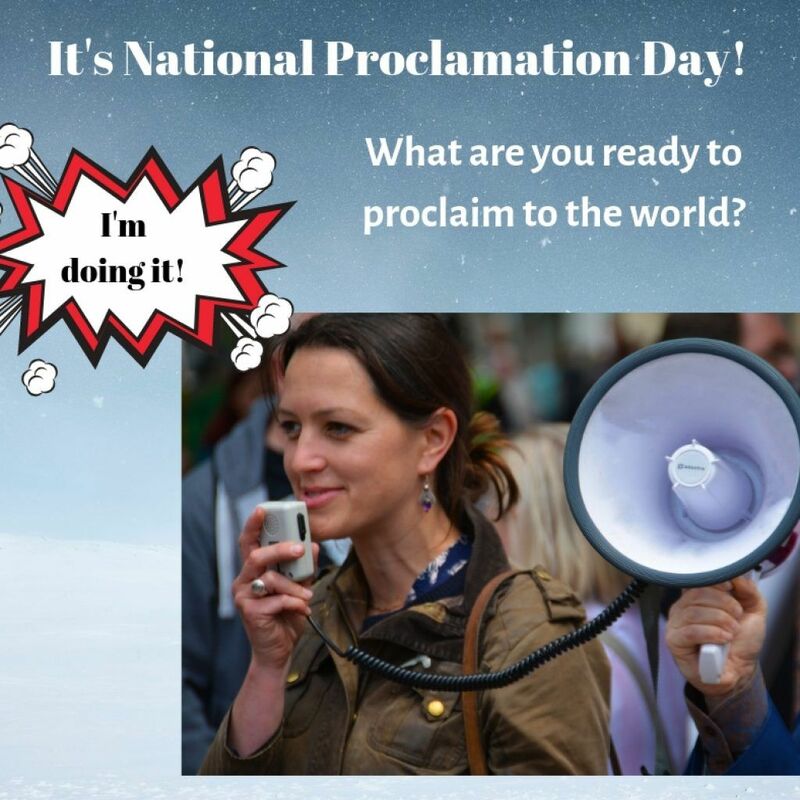 Let's do this thing together on National Proclamation Day 2019. Go ahead and write your proclamation in the comments. Put it out there for the world to see, and you will get it done. I'm challenging you today. If you'd like to chat about how I might be able to help you please schedule a free Freedom Through Faith Discovery Session.